The 870 Series SCR Control panel is a fully proportional process temperature control panel that utilizes SCR Power Controllers to modulate the entire heater load directly, varying the heater output from 0 to 100% of the total heater KW. Working on a four second time base, the heater will be energized only for the number of AC cycles necessary to produce the exact amount of heat required. The resulting precision control and rapid response make the 870 Series SCR Control Panel the best choice for applications that must accommodate material flow changes and still provide precise temperature control. The panel is completely assembled, pre-wired, tested, and ready for trouble-free installation and operation. Designed for use in industrial environments and outdoor installations. □ Control Relays – These relays are activated by safety devices, such as a flow switch or remote shutoff. □ Indicator Lights – Additional indicator lights may be specified for visual indication of system status, such as “LOW TEMPERATURE”. □ Audible Alarm Package – Includes a horn, pilot light, latching relay and a push button for silencing the horn. □ Low Liquid Cutoff – The relay is mounted and wired with sensing probe shipped loose for field installation. □ Motor Starter – This package consists of a motor starter for pump motor start-up. Motor starter is internally mounted and field connected to the pump motor. □ Special Controllers – The customer may specify the use of special process or over-temperature controllers for a different temperature range, sensor input, control mode, etc. □ Panel Heater – A heater and thermostat are provided to prevent condensation and maintain minimum ambient temperature for electrical components. □ Wire Markers – Identification markers are attached to both ends of all control and power wires. 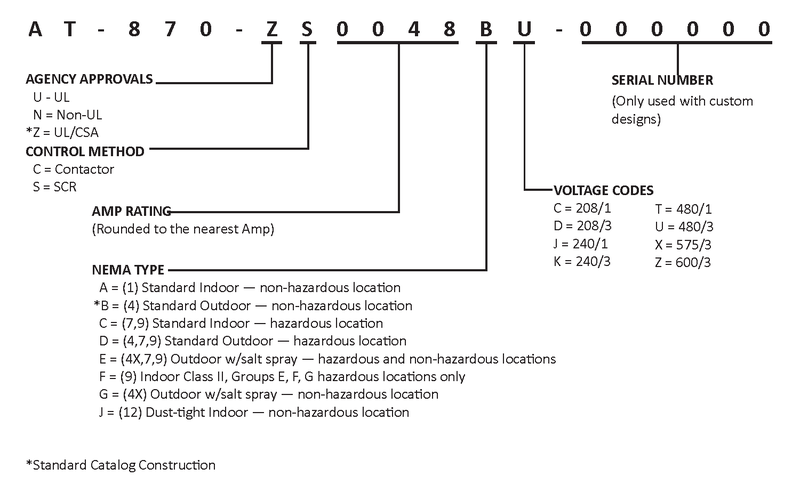 □ Tagging of Internal Parts – Permanent tags are attached to the subpanel near internal parts and marked with component titles as noted on the wiring diagram. □ Explosion-Resistant Panel – A cast aluminum enclosure is rated for Class I, Groups C & D and Class II, Groups E, F & G (NEMA 7, 9). □ Special Coatings – Epoxy or other paints may be specified. (1) Agency listed for NEMA 4 only. *These panels have double doors and 12” high floor stands. ** Additional 9” clearance required for externally mounted heat sinks which may be mounted on one of both sides of the enclosure.